There are zombie books, zombie television shows, zombie costumes, zombie comics, zombie films and lately there has been an overflow of zombie video games. Let me be the first to tell you that this zombie craze is not about to go away. Left 4 Dead may have started the zombie video game craze but nobody else has come close to taking the next step. Did I say nobody? Let me correct myself. A small, tiny company by the name of Housemarque (nobody, right?) 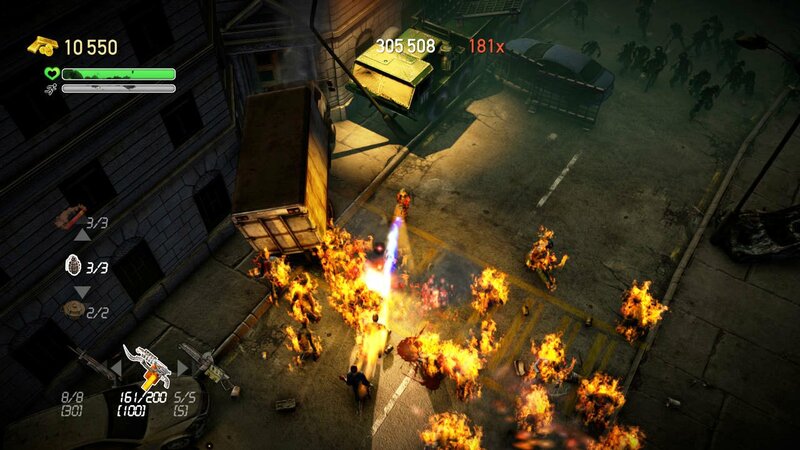 has officially taken the next step in the zombie craze with their game Dead Nation on the Playstation 3. Believe it or not, the developer Housemarque actually created the game Super Stardust HD, which I am sure many of you have played. It seems that this tiny indie company is about to make a name for itself with a zombie game that throws away all of the cartoony kid stuff that Burn! Zombie Burn! threw at us and gives us a different perspective on how to use the elements around us as weapons. Left 4 Dead did something right. It was a zombie game that brought the community together and let a lot of people play together while killing zombies. There was something missing though. As scary as Left 4 Dead was, it never really allowed the player to visually capture a true zombie epidemic (unless you count a tank coming at you). Dead Nation almost gets this perfect. 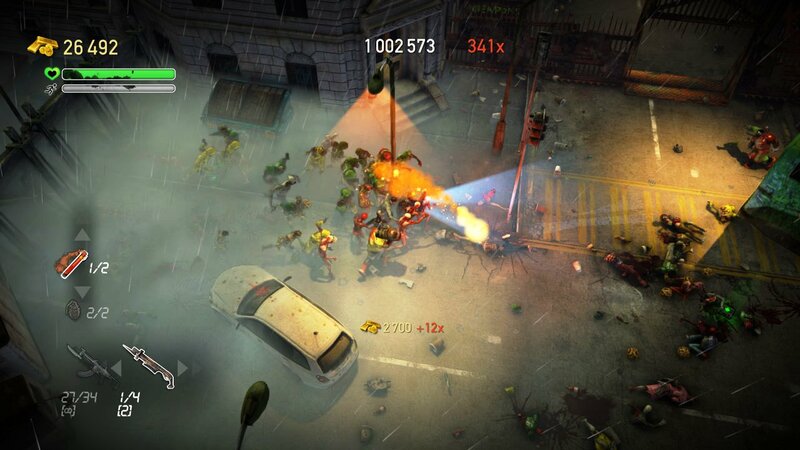 The shear panic of having hoards of zombies crash down on you at anytime sets this game apart from others. You begin the game as either a man or a woman with your basic weapon set (a rifle, a grenade and a flare). The story is your basic zombie tale of a virus that broke loose and mass amounts of infected are out to kill anything that tries to survive. 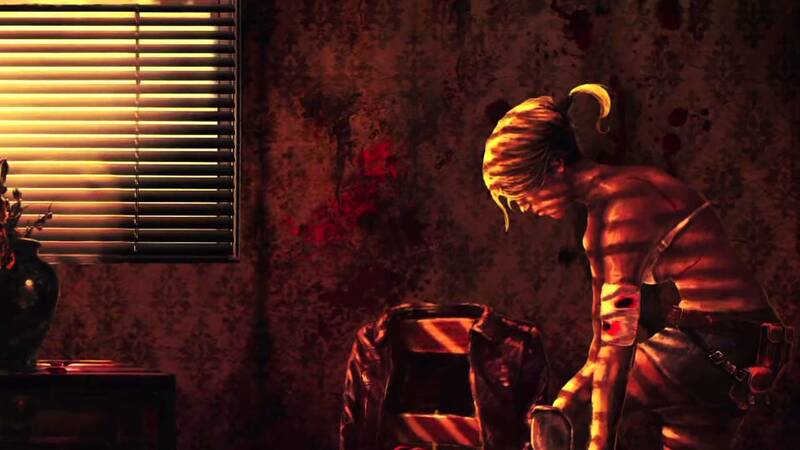 The game creates this story with pastel art attached to a comic book feel. The twists and turns come when you discover experiments gone wrong and some humans have turned into giant beasts with abilities much like the ones seen in the Left 4 Dead series but much weirder and with nastier sound effects. The controls are almost perfect. The layout takes a bit of getting used to but once you memorize everything it all comes naturally especially with the weapons. The one thing I will highly praise about this game is the weapon choices and how unique each weapon is. Want to take a zombie out with a single shot? Charge up the rifle, aim and shoot. Too many zombies? Use the SMG to spray those bullets at them. Zombies coming from both sides? Throw a land mine to the left and the right and watch them all blow up. Want to see a shocker? Use a gun that shoots electricity through multiple zombies. Oh, and there is also dynamite. Yes, dynamite! The perspective in Dead Nation is a top-down view and it works really well. 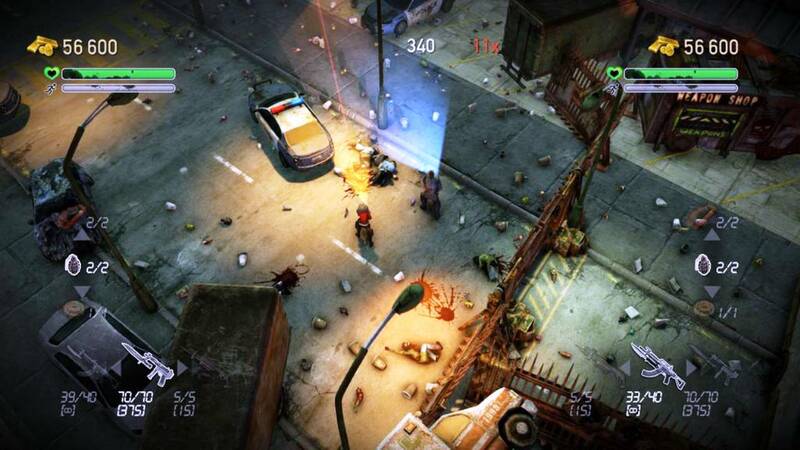 Zombies fall from buildings right on top of you and you can also see everything that happens around you. The scariest part is when the environment turns pitch black and all you have is your gun and a flashlight. I do have one little problem though. This game incorporates cooperative play, which is awesome! This two-player coop works perfectly and it is a lot of fun. Unfortunately that is where the awesome ends. The two-player coop is either same screen or online. The online portion of this multiplayer does not support using headsets to talk to the other person (though they have said they will update this in a patch). Unfortunately this is a big hit to the game especially when playing with other people who are not right next to you on the couch. This isn’t what I am most upset about though. Where are the multiplayer modes and the 4-player coop? With a game that is so simple it would seem so easy to incorporate more players and have at least a survival mode brought into it. The ranking system is a nice touch but so much more can be done with this game and it makes me feel that the effort just wasn’t there. Overall, this game is excellent minus the few multiplayer mishaps. The music is amazing, the sound effects are creepier than ever before and the gameplay is one of the best in an indie game that has appeared on the PS3. Congratulations Housemarque on delivering a quality title that is worth the download. Seriously, go download it now!